I'm Xerxi, former professional photographer, and I'm a Swedish variety broadcaster on Twitch, living in the UK. I'm a dog Mum to my very good girl Metalica in Sweden, and cat Mum to my moody (King) Arthur in the UK and baby kitty Merlin. I'm also known for my obsession with tea, sushi and chocolate. 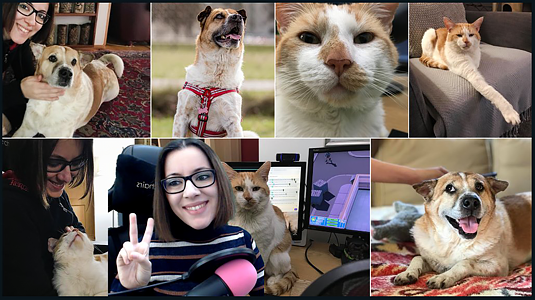 After suffering health complications, which rendered me unable to keep the job that I had, I'm now a full-time live streaming content creator on Twitch, streaming 5+ days a week, and I've never been happier in my life. This is my dream job, my passion, and I enjoy spending time doing what I love and creating a beautiful, amazing community full of smiles and laughter lovingly known as the Tea Cult. However, there's always the financial uncertainty that comes with the job, and this is where Patreon comes in - providing an additional source of steady income and thus removing the uncertainty. By being my patron, you'll be helping me doing what I do best and for me to keep on pursuing my dream - creating goofy, fun and positive entertainment for all of you. Thank you for considering being my patron and please keep on enjoying what I create! Thank you so much for your support, it truly means the world to me - and thank you for letting me pursue my goals and dreams! <3 I'll always keep working hard in order to provide positive vibes and great entertainment for you! • Preview any upcoming new emotes and channel art before the public! • 3 polaroid photos signed by Xerxi PLUS hand-written letter! If I ever reach this goal, this will greatly help me in funding my ability on a full-time basis to keep on releasing content with positive vibes on Twitch as a broadcaster and entertainer. Thank you for allowing me to live my dream and create content for you!